The Yorkshire Dales offers some beautiful scenery and walking trails so we packed our walking boots and set off bright and early one late January morning for an overnight visit. We decided to stay in Bolton Abbey nestled in the heart of Wharfedale. It’s a picturesque village located between Skipton and Harrogate in North Yorkshire. We’d reserved a room at the Devonshire Arms Hotel & Spa which has been a landmark of the village since the early 17th century. The hotel came into the ownership of the 4th Duke of Devonshire in 1753 as part of the Bolton Abbey Estate. Over the years, the hotel has been further developed and in 1981 underwent a major refurbishment under the supervision of Her Grace the Dowager Duchess of Devonshire with many of her personal touches still in evidence today. As soon as we had parked our car, the concierge, smartly attired in country tweeds came to greet us and carried our luggage into the elegant yet homely hotel lobby with its log fire, stone flags and beautiful antique furnishings. Our luxuriously appointed room was located on the ground floor, its windows perfectly framing the magnificent views across the estate to Beamsley Beacon which rises to 328 metres above sea level. There was a Nespresso coffee maker and thick slices of traditional Yorkshire parkin, which is northern England’s answer to gingerbread, differing as it is made using oats. Lifting the lid of a little dish we also found home made cookies, a treat for our afternoon tea. 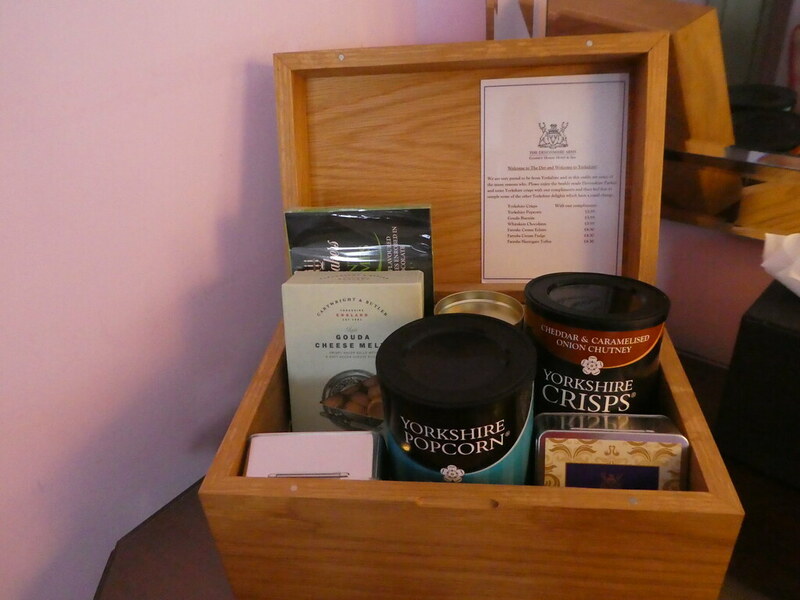 Next to the bed there was a small wooden hamper containing a selection of Yorkshire delicacies to enjoy. Being curious to see more of this former coaching inn, we went for a wander around the hotel and found several cosy lounges with original art work from the Chatsworth collection. After admiring the paintings, we settled down for cups of coffee in the Dog Lounge with its gorgeous dog themed decor and life size ornamental dog sitting by the fireside. Relaxing on one of the comfortable sofas, we felt warm and cosy and could easily have been tempted to linger longer. As we wanted to explore the surrounding estate, we popped our coats back on and headed outdoors. The Devonshire Arms provides guests with complimentary parking permits for use in all of the estate’s car parks making it easy to explore the stunning Yorkshire Dales National Park countryside. It was only a short drive to the centre of Bolton Abbey from where we walked through a stone archway to the ruined Augustine priory. The land was given to the Augustinian canons in 1154 who worshipped there until 1539 when the dissolution of the monasteries took place, stripping the priory of all its assets. 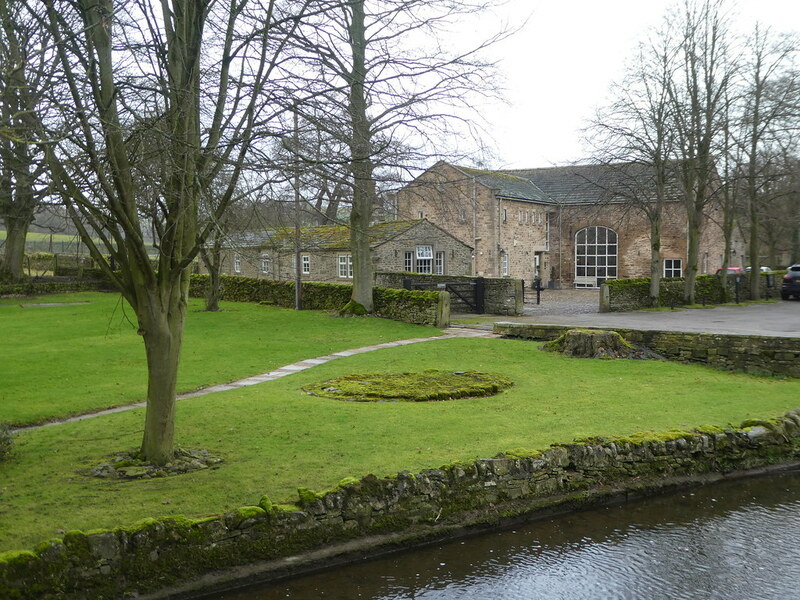 The ruins are located in a stunning setting, overlooking the River Wharfe. Next to the ruins lies the Priory Church of St. Mary & St. Cuthbert which is one of the finest medieval churches in the north of England. Despite the loss of most of the Priory buildings, the western half of the original nave was preserved, allowing the local parish to continue worshipping there. In front of the Abbey are the stepping stones which were originally laid as a crossing point for the lay workers of the priory. Nowadays the 60 stones offer a fun way to cross the river. Unfortunately, the river was high during our visit, submerging the stones beneath the water so we made use of the adjacent wooden bridge which offers a safe crossing point throughout the year. After strolling along the river bank a little further, we retraced our steps so that we could return to the hotel in time for lunch in the hotel’s Brasserie. The Brasserie has a contemporary feel with wooden floors and vibrant, striped furnishings. 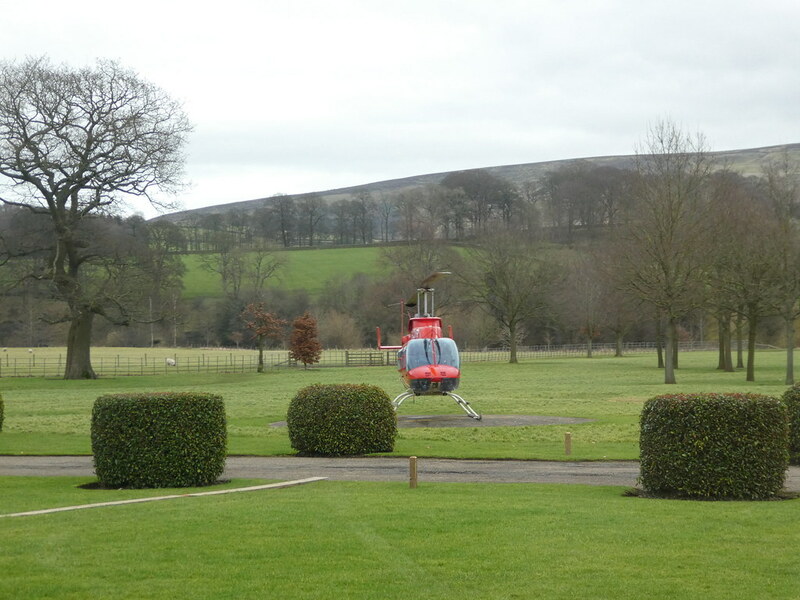 We were shown to a window table and whilst we were looking at our menus a helicopter arrived on the lawn. 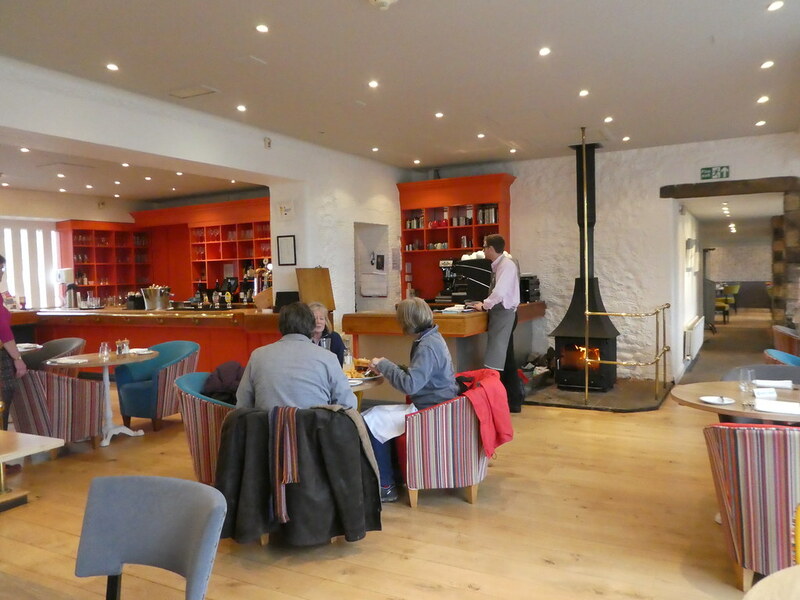 The passengers came into the Brasserie for lunch – now that’s definitely the way to travel! The menu had lots to tempt us, but I finally settled on the Devonshire Fish Pie which was filled with king prawns, salmon, cod and smoked haddock, topped with creamy mashed potato – delicious comfort food for a winter’s day! 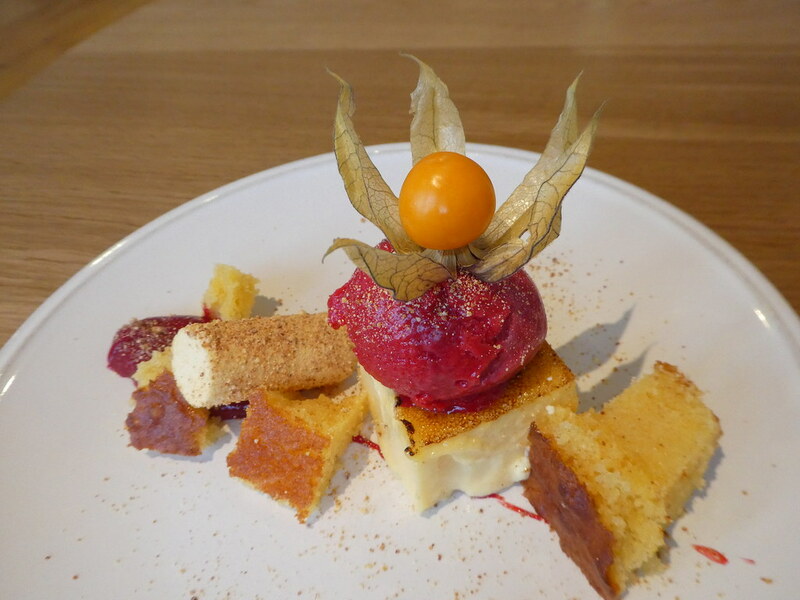 For dessert, I was again spoilt for choice but was delighted with my Trio of Lemon, comprising baked lemon cream, lemon parfait, lemon cake and a refreshing raspberry sorbet. After cups of coffee we needed more exercise, so we strolled through the hotel’s grounds for a wander around the south facing vegetable garden which was established in Victorian times and reinstated more recently. 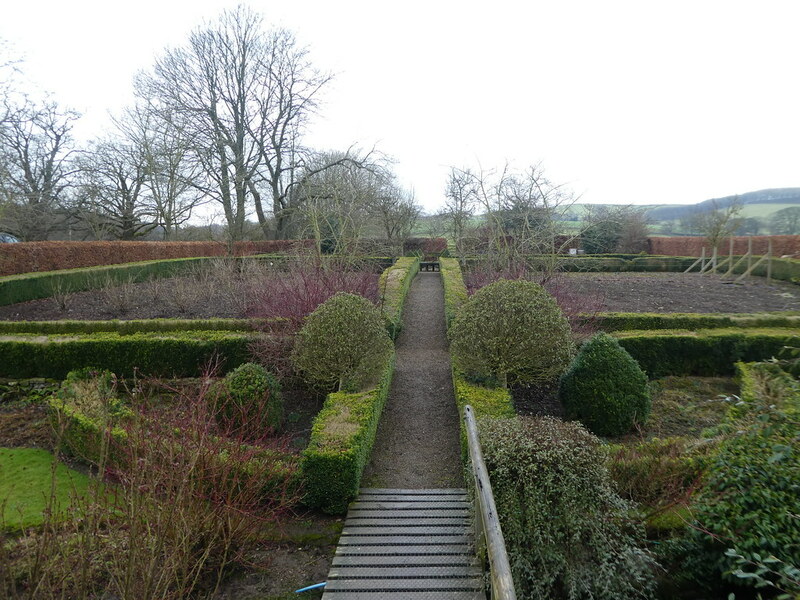 The garden is designed in tiered sections with low box hedges and traditional dry stone walls providing shelter. As it was mid-winter there wasn’t too much to see, but during the warmer months it provides a plentiful supply of seasonal produce for the hotel’s kitchens. Up in one corner, we spotted some bee hives, no doubt a source of honey for the chefs. Returning to our room, we unpacked, picked up our swimwear and then made our way over to the Devonshire Spa which is housed in an ancient barn just a few steps from the hotel. On arrival, we were handed fluffy aubergine dressing gowns and towels with pairs of matching flip-flops. After changing, we took a dip in the good sized pool where the water was lovely and warm. After our swim we spent some time relaxing in both the jacuzzi and sauna before returning to our room to prepare for dinner. In addition to the Brasserie where we had enjoyed lunch, the Devonshire Arms also has an award winning fine dining restaurant called the Burlington. I’d taken two dresses with me and had to have a little fashion parade in the room before deciding which one I wanted to wear! Decision made, by 7.30 p.m. we were both sitting comfortably in the cocktail lounge enjoying pre-dinner drinks and canapés served on a Westmorland slate. 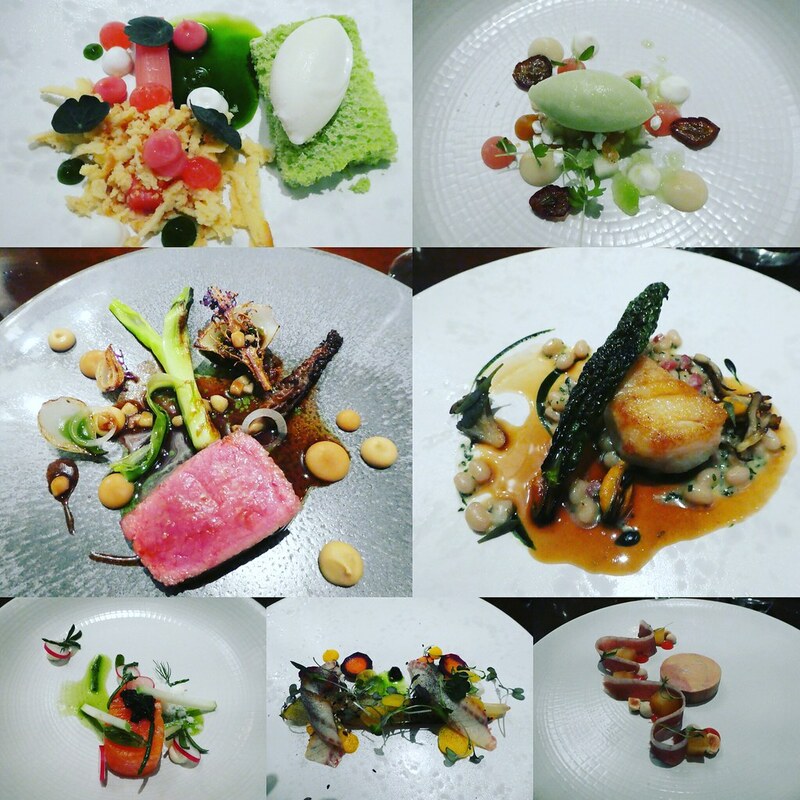 We’d heard that Paul Leonard who joined the Devonshire Arms last summer is one of the UK’s most talented chefs so we decided to opt for his 8 course seasonal tasting menu. The restaurant uses some of Yorkshire’s finest ingredients with meat and fish reared or caught on the Duke of Devonshire’s estate. 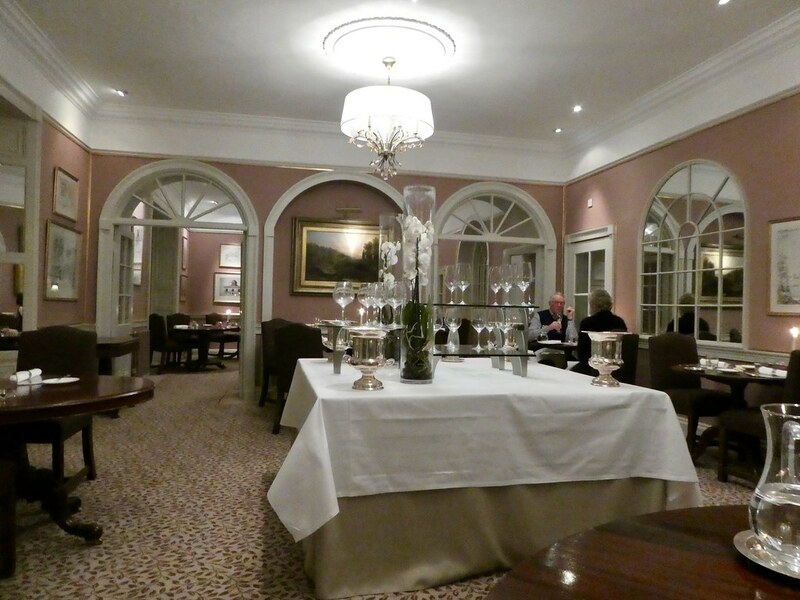 After selecting from the extensive wine list, we were shown to our table in the elegant restaurant. Despite the formality, we received a warm and friendly welcome which created a relaxed atmosphere during this special dining experience. As each course was delivered to the table, the waiters would describe the dish and were more than happy to answer any questions we had. You might think that an 8 course meal would be over-facing but the portion sizes were just right to be able to enjoy each course comfortably. The combination of flavours and textures were sublime and coupled with the beautiful presentation we were both in food heaven! 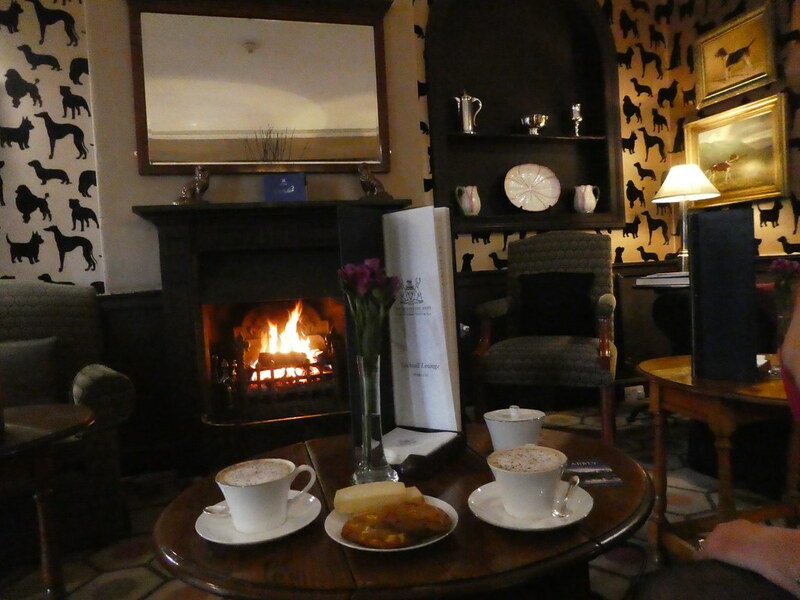 We rounded off the evening relaxing in on one of the cosy lounges which oozed country house charm. Here we enjoyed a cafetière of coffee and some petit-fours reflecting on what a lovely day we’d just had. You have a good blog and a very nice pictures. Thank you, it’s good to read that you are enjoying reading my posts. Thank you for your kind words. It’s so nice to read that you are enjoying reading my blog. Thank you, it is a very picturesque place. I fell on love with the Yorkshire dales when I was there, and saw Bolton Abbey by sunset. So inspiring! Bolton Abbey is so beautiful, it’s good that you were able to visit. You have a very poised writing style, it almost felt like I was reading a story. Thank you for your inspiring thoughts, it’s so nice to read you are enjoying my blog. We had the good fortune to hike the Peaks district for 7 days in May 2017 while visiting friends in Sheffield. Stunning scenery, great pubs and food. They mentioned the Yorkshire Dales. Guess we have a reason to go back for another visit. Oh yes, I think you would enjoy a visit to the Yorkshire Dales and Bolton Abbey offers lots of walking opportunities. Hopefully you can add this to your lust when you are next in the U.K.
Looks so interesting and the pictures are so inviting, really lovely post, thank you! 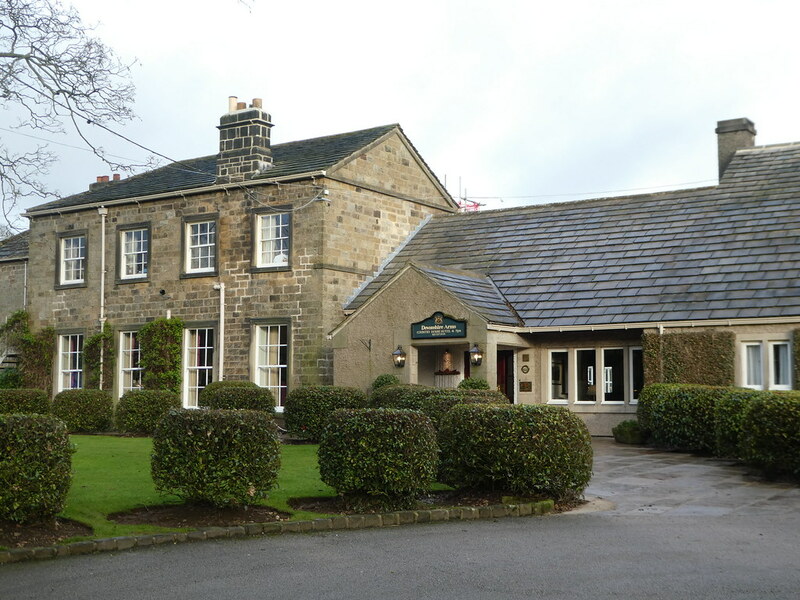 Thanks Karen, the Devonshire Arms at Bolton Abbey is really lovely. It’s absolutely gorgeous – I do hope you have a chance to visit sometime! Such a posh and wonderful place you stayed at Marion. 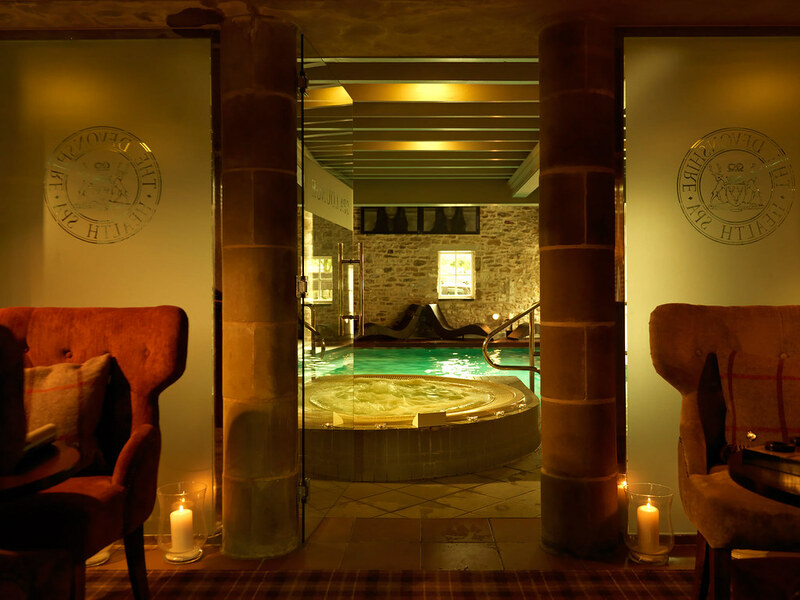 I love anywhere with a spa; so lovely to enjoy a swim and spa before such a special dinner. The degustation looks amazing and I like how the meals are small enough so you were able to taste and enjoy everything and one more thing I love your photos and the lemon dessert for lunch is definitely my type of dessert. A very interesting post with beautiful pictures. I need to return to York for a visit. Been some some 15 odd years ago, I wish I was into blogging then. You give reasons to return. Have a wonderful weekend! Thank you for taking an interest in this post. I do hope you get an opportunity to return to Yorkshire before too long. Thank you for sharing this. Vividly written 🌷. It’s my pleasure, I’m so pleased you enjoyed reading about lovely Bolton Abbey. We can all have dreams, and sometimes they become true! Back down to earth, the Devonshire fish pie tasted absolutely delicious! Thank you Ian for your inspiring thoughts. Bolton Abbey is a beautiful part of Yorkshire to visit and enjoy an overnight stay. A perfect Winter getaway! We’re sweltering here so it was nice to spend time with you in chilly Bolton Abbey. Everything seemed delightful. It was a lovely short break in Bolton Abbey, chillymoutdoors but warm and cosy inside. Hehe, would be so great! I feel as if I traveled through Yorkshire and had a marvelous time. Thank You for sharing. Thank you for your kind words, it’s so nice to read that you enjoyed this post on Bolton Abbey. How charming! Our travelers always enjoy their trips to the UK. Can’t wait to read more! Thank you for your much appreciated thoughts. 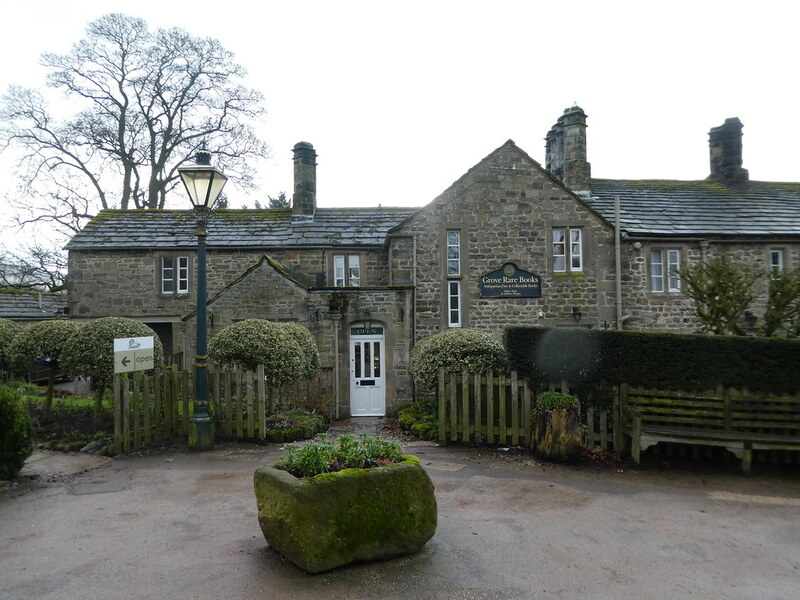 I do hope your travellers have an opportunity to visit the Devonshire Arms in Bolton Abbey sometime soon! 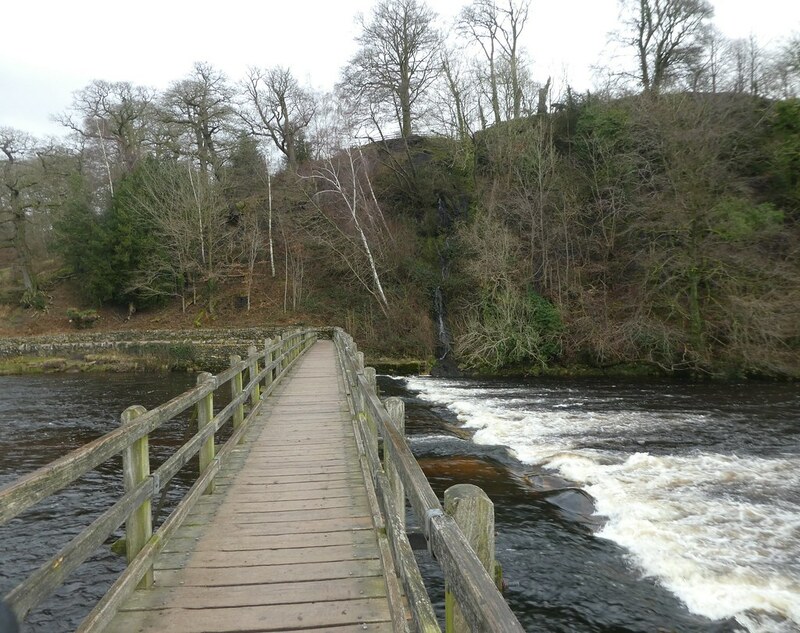 You are right, there are so many different walking trails at or near to Bolton Abbey and the scenery is beautiful. I agree the car parking is very expensive although they do offer a mid week winter rate of £4. That’s not so bad, then. Just need a sunny winter day 🙂 🙂 I’m not back for 3 weeks so it might be Spring by then. Continue to enjoy your stay in the lovely warm sunshine of the Algarve Jo. It was sleeting here yesterday! Looks like you had a great time. I love Bolton Abbey and nothing beats a crackling fireplace in the winter. Thank you, Bolton Abbey is indeed a lovely spot at any time of the year and staying at the Devonshire was warm and cosy. This sounds wonderful, Marion. What a delightful way to spend a weekend! It was absolutely amazing Susan. Thank you for your ever welcome thoughts. Looks like a great place. Next time I return to the UK I must check this out. So pleased you liked this post. I’m sure you would enjoy visiting Bolton Abbey. Waouh the 8 courses, the food look so delicious. Thank you for taking an interest in this post. The tasting menu at the Devonshire Arms was absolutely delicious! I truly enjoy your writing! The photography is also incredible. I’ve enjoyed your blog for the past couple months, you keep me motivated in my writing as well. Thank you for sharing! Thank you so much for your inspiring comments which mean a lot. I’ll also take a look at your writing as soon as I have a few minutes to spare. It looks and sounds absolutely marvelous! ….. offer some stunning scenery. Thanks Noel, Bolton Abbey has some stunning scenery and a lovely hotel. A really interesting read! Might be tempted to visit! Thanks Susie – I do hope you manage to fit in a visit to the Devonshire Arms at Bolton Abbey sometime! What a lovely trip! Thanks for sharing it. Thanks Sandra for your much appreciated thoughts. Its pleasing to read you enjoyed this post. I really enjoyed your post and the tour. Great pictures , made me more anxious to visit. I have never been to England, maybe one day I will and visit this marvelous place. Sara. Thanks Sara for your much appreciated thoughts on my recent post on Bolton Abbey. I do so hope you will have an opportunity to visit England one day – that would be nice! Devonshire Arms looks so cozy! Thank you – the hotel is beautiful! your travel accounts are as if television sops very exhaustively the scenes described and pics tempting for drawing up a schedule to be in UK. Excellent. do sometime visit my blog site to see something pleasant to read and think of. Thank you for your kind words. I do hope you have an opportunity to visit England and in particular, Yorkshire one day soon. I’m going to make a cup of tea now and settle down yo take a look at your blog. i am regular reader of your posts because you write beautifully and i travel extensively myself . no chance yet of visiting London york shire. I do hope you make it there one day. Thank you so much for your inspiring thoughts. What a wonderful post. Your photos are very beautiful. Ruins and Foot Bridge are my favorite photos. I am history lover. 🙂 It was a great joy to visit this place thru Your photos. Thank You. 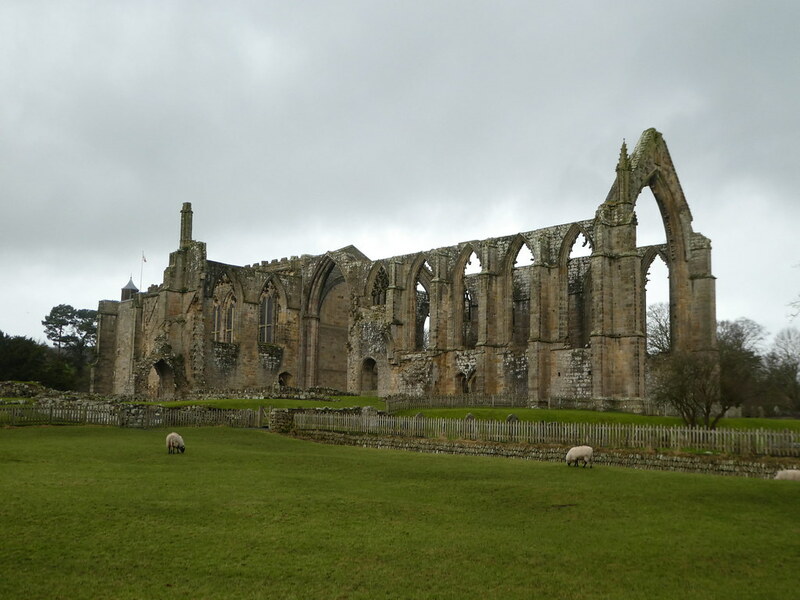 Thank you for your inspiring thoughts on this post on Bolton Abbey in North Yorkshire Matti. Thanks Shazza for your kind words. It’s great to read that you have visited the Bolton Abbey area many times and are familiar with the stunning Yorkshire Dales National Park scenery. The images are breathtaking. I especially loved those stone houses and the small bridge over the stream. Thank you Balaka for your kind words. I do hope that you may have an opportunity to visit Bolton Abbey sometime soon! Exactly Tanja – I can’t imagine it ever happening to me but it was fun to see the helicopter land on the hotel lawn! Thank you for your interesting thoughts on this post. The old stone buildings are so nice and the local stone is grey. Perhaps the sun has caught my photos, making them appear a little warmer. Beautiful photos, especially the Trio of Lemon Dessert. I loved the Bolton Abbey, I have visited once during Winter, just about the time of snowdrops. It’s grounds has an amazing carpet of Snowdrops. Lovely post , enjoyed reading it. Happy travelling!!!! Thank you Ushasita for your kind words. It’s so nice to read that you have also visited Bolton Abbey during the winter months too. Thanks Mary for your kind words. I’m so pleased you enjoyed my tour of the Bolton Abbey estate. I visited that area in 2011 and loved it. No way as luxurious as that, though.The Duke of Devonshire seems to own half of England. That’s so interesting to read that you have already visited this part of Yorkshire – it’s so beautiful and there are so many tempting walks and pubs around. What a wonderful mini-break. Just proves you don’t have to go a long way to get away from it all. Exactly, there are some lovely hotels and stunning scenery in the U.K. and we really enjoyed our short break. What a delightful narrative coupled with marvelous photos. Thank you for your kind words. 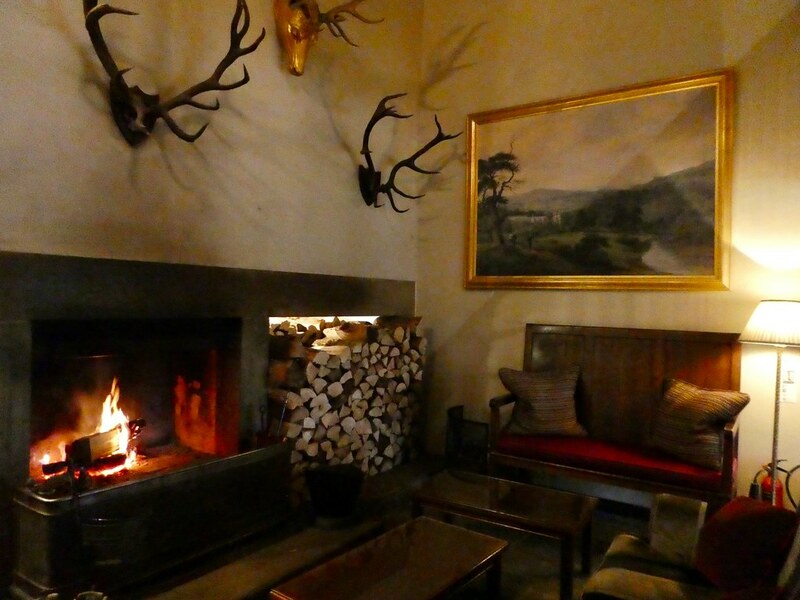 The Devonshire Arms is the perfect place to unwind, relax and enjoy the countryside. Thank you, both the hotel and the Bolton Abbey estate are beautiful. 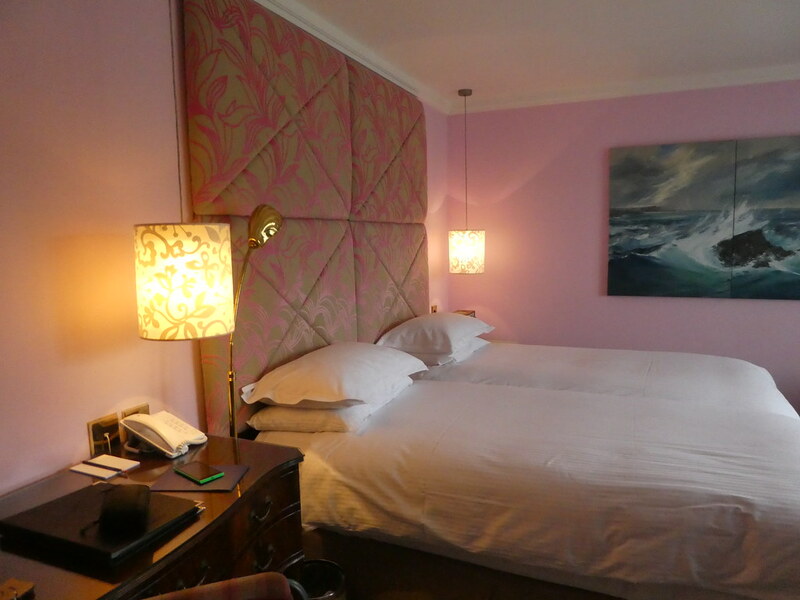 The Devonshire Arms is a very luxurious yet cosy hotel and definitely perfect to beat the winter blues and unwind. Thanks for your welcome thoughts Miriam.